olive oil | I Am Not A Restaurant! Today a lesson in food history. The invention of the spoon predates comfort food. No chicken/egg dilemma here. Think about it – cereal with milk, mashed potatoes and gravy, chicken soup, Ben & Jerry's from the pint, the scrapings from mac & cheese, peanut butter from the jar, lemon curd (trust me!). They would be nothing without the spoon. The spoon came first. At least 8 ounces mushrooms, sliced or chopped – feel free to rehydrate dried mushrooms too! Add the strained liquid to the pot. Render the fat out of the pancetta in a tall sided, heavy bottom pot, medium heat or lower. Meanwhile heat broth to a simmer and keep it there-it will absorb in the rice better. After about 10-15 minutes, take out the meat, leaving the fatty deliciousness. Add the onion and a sprinkle of salt. Cook for 5 or until soft. Add the garlic, cooking 1-2 minutes. Raise the heat. Throw in the mushrooms, cooking until the liquid is gone. Add the rice, tossing with the fat and veg in the pan. Now cook in the wine until it's mostly evaporated. Add stock by the ladle, waiting until each ladle is absorbed to add more. and give it a stir every few minutes. 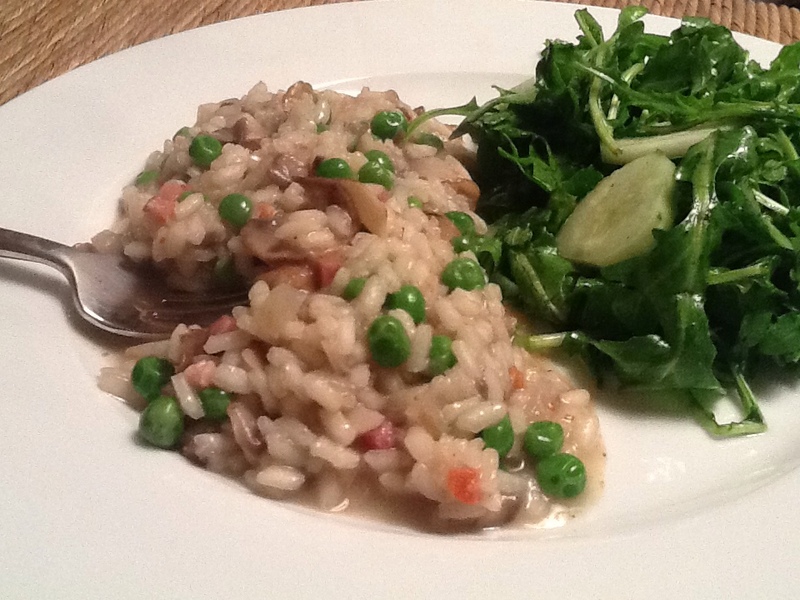 When rice is just about cooked thru but still firm, add peas. Heat and turn off flame. Add butter, cheese, salt & pepper to taste. It takes about 20 minutes once the rice goes in, keeping the bubbles at a steady clip but under control. Serve with extra cheese and/or a sprinkle of fresh herbs. Make sure they (your family) appreciate you for your excursion into classic Italian comfort food. I knew it! I knew if eating depended on a child, and the child was hungry enough, food would get into the oven! Tonight we (we!) 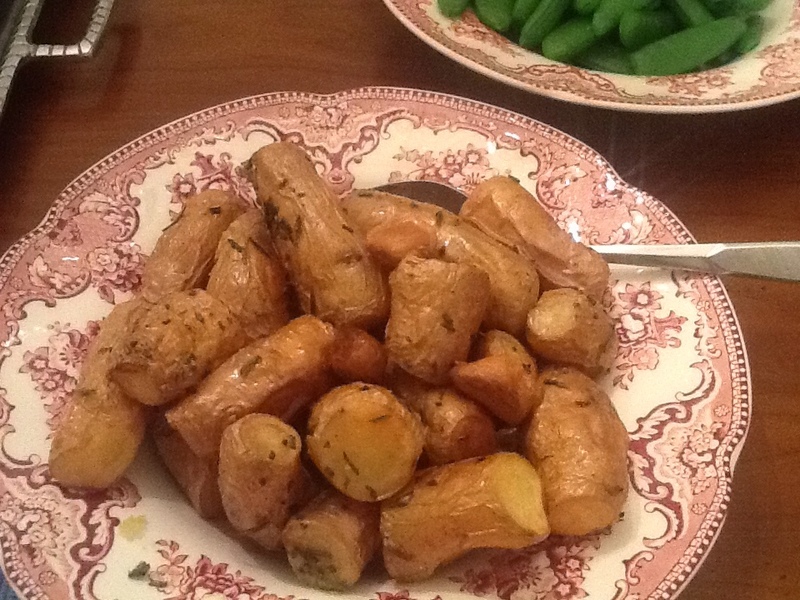 bring you…roast chicken & potatoes. I prepped the chicken, and left out the ingredients for the potatoes. The 14 year old did the rest, proving if you want to reach that generation, text the instructions! Also I tried something new with the chicken. 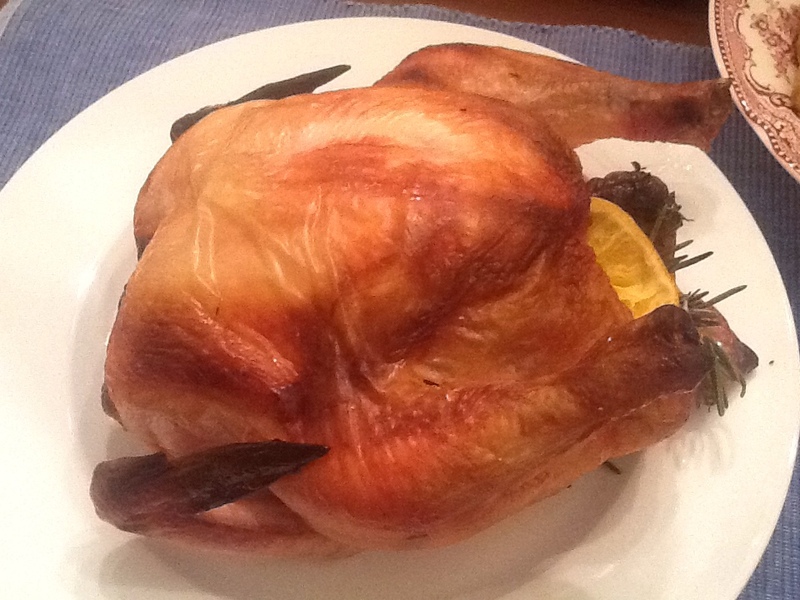 From Zuni Cafe's Judy Rodgers I learned to kosher salt a smallish bird the night before roasting, maybe even longer. But from my brining friends I've also learned to experiment with extra seasoning. Bathe the chicken with some fresh OJ, stuff the rest of the slices in and around, herbs, salt and pepper. Fridge overnight. Bring to room temp 30 minutes before roasting. Preheat oven to 375. Bake until breast hits 165 on meat thermometer. After resting, both of us, I also check thigh temp. Toss all ingredients together. Roast at 375 for at least 45 minutes. Squeeze garlic over pototoes. I'm pretty sure you couldn't get any more budget friendly. Even better to be able to use pantry staples and the dregs of the fridge to churn out a second helpings necessary pasta?! Kitchen life doesn't get better than that. Ripped from the pages of Bon Appetit, I give you a way to use kale that will make you devoted. 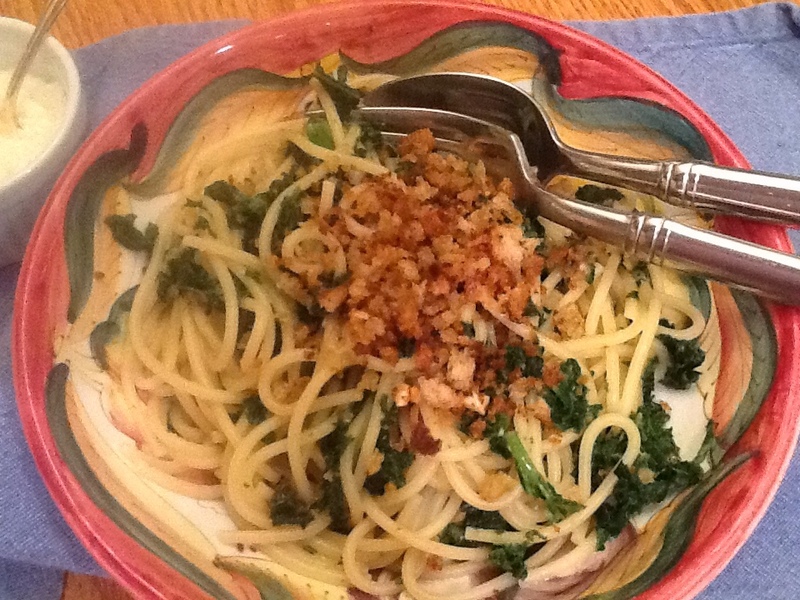 Porsena's Sara Jenkins created this recipe that seasons the bread crumbs, the kale and the pasta separately. Divine! I didn't have orecchiette, a pasta shape named for and reminiscent of small ears. Spaghetti worked just fine. I also wouldn't advertise the anchovies unless you know the audience, or the kale for that matter. In fact just make and serve. Enough with the hard sell to a tough audience. If they're garlic lovers, that should be enough. Also, my guy claimed it was perfect as is, but I might lose a little of the butter and add lemon zest next time. It was perfect, but we can't help ourselves. Next up Sarah's ragu! After that I hope to lure her onto “Living At Home”, my series on SiriusXM 110, 10-noon east, tempting talk from the day's headlines, health news you can use, to what y'all can serve for dinner. It was supposed to be Sunday supper, but we couldn't wait. Hence, lunch! With 20 minutes and a few basic ingredients, you are on your way. 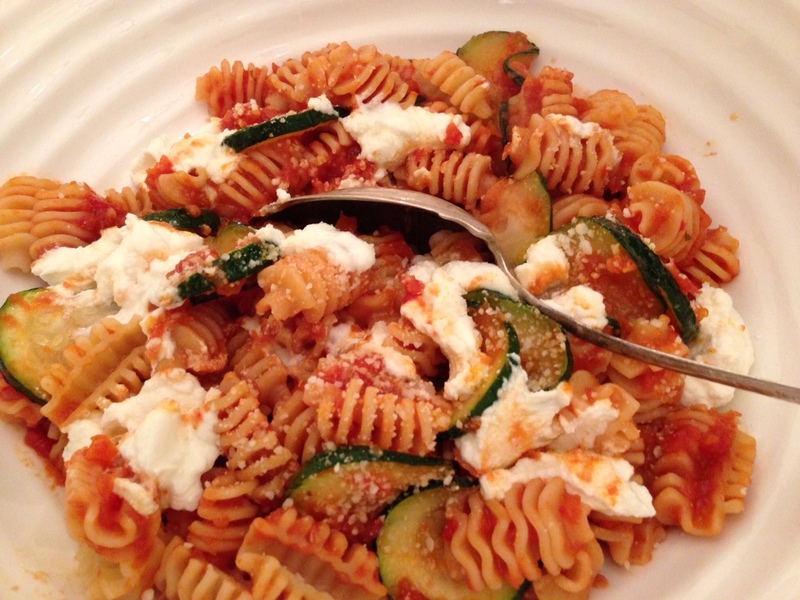 Plus this pasta bowl is a no recipe recipe with plenty of mix and match opportunities. Since we went to Tuscany (brag!) this summer, I am obsessed with pici – a rustic, starch rich, slow cooking pasta. Seriously, I stowed extra poundage to bring home, only to discover it in a modest specialty shop around the corner. I keep it on hand, but your fave pasta with or without gluten will work. Just know starchier pastas can make a “creamier” sauce. Get the pasta water started first, to speed meal prep. Using a pre-cooked sausage over fresh can help as well. Cook pasta according to directions, saving 1 cup cooking water for sauce. Melt the veggies in a generous dollop of olive oil for 8-10, medium heat (add garlic if desired) in large skillet. Salt and pepper. Add sausage, browning and cooking thoroughly. Drain pasta. 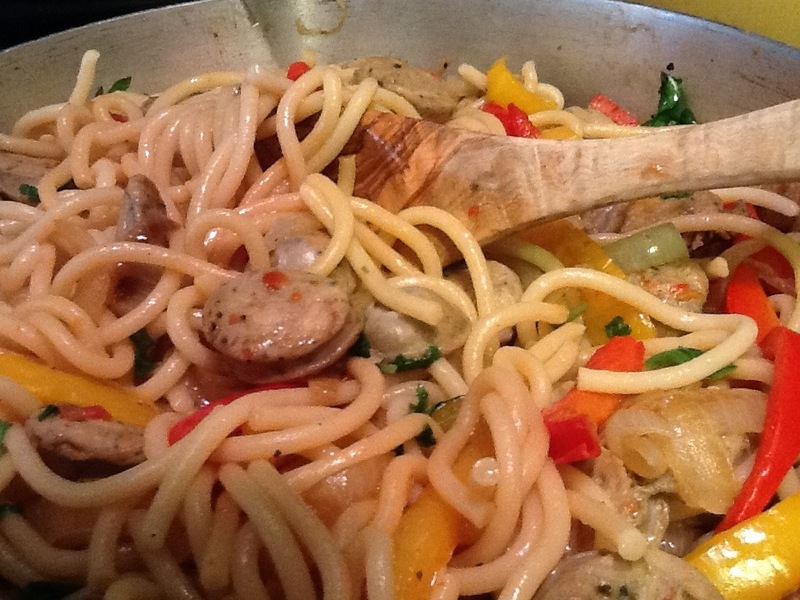 Combine pasta with other ingredients in skillet. Toss with enough pasta water to make sauce (I used the whole cup this time!). Stir in basil. Add butter if desired, cheese to taste.